1. Put the couscous in a bowl and pour over 350ml boiling water. Cover with clingfilm and leave for 8-10 minutes, until the couscous has swelled up and absorbed all the water. Ruffle with a fork to separate the grains, then stir through the pomegranate seeds and herbs. 2. Mix together the orange zest and juice, vinegar and olive oil. 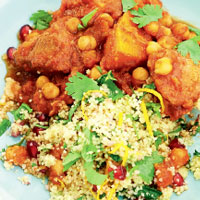 Stir into the couscous, season and serve with the tagine.